Pita bread is a type of flatbread that is made out of wheat. In some cultures, it is often consumed daily. Over the years, it has become more common in the United States. Pita bread can be part of a health-conscious diet and works well with many cuisines. A 6-1/6-inch piece of white pita bread contains 165 calories. If you are using it to make a sandwich, you may save calories. You only need one piece of pita bread to make a sandwich, as you insert your sandwich filling inside the pita bread. Two pieces of ordinary bread could contain 200 calories or more. Pita bread contains less than 1 gram of fat per serving. Pita bread has 5.5 grams protein and 33 grams of carbohydrates. Of these carbohydrates, little more than 1 gram is fiber. You can increase your fiber intake by eating whole wheat pita bread, which contains more than 6 grams of fiber per serving. Whole wheat pita bread contains fewer refined carbohydrates, which should be avoided whenever possible. Refined carbohydrates can contribute to obesity, abnormal cholesterol counts and Type 2 diabetes, according to a study about America’s increased consumption of carbohydrates which was published in the 2004 "Journal of Clinical Nutrition." A piece of white pita bread contains more than 10 percent of your recommended intake of the B vitamins thiamin, riboflavin, niacin and folate. White pita is also high in selenium, with 16.3 micrograms, which is over 30 percent of the recommended intake of 45 micrograms. 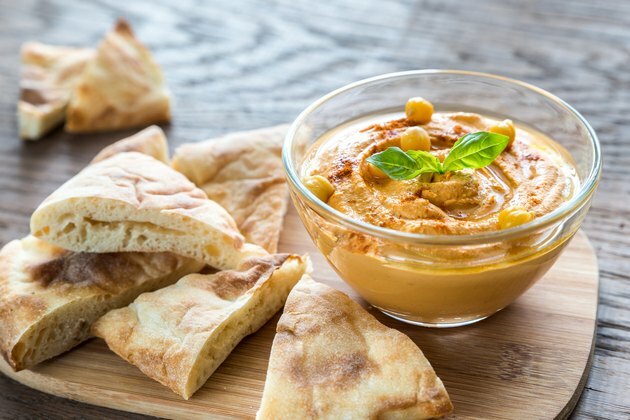 Even though pita bread doesn't have a salty taste, watch out for sodium, as only one serving contains 322 milligrams, more than 20 percent of the recommended intake of 1,500 milligrams set by the Institute of Medicine. If you buy whole wheat bread, you’ll be consuming significantly more magnesium. Whole wheat pita bread also has higher amounts of the B vitamins. It is lower in calcium than white pita bread. Pita bread is a flat bread that contains a “pocket” in the middle. It is used in many cultures around the world as a way to eat stews -- the bread is used to scoop up the meat or beans in lieu of a spoon. In the United States, it is most often used to make sandwiches. Pita bread can hold almost any sandwich filling and can be served hot or cold. You can put sauce, cheese and other toppings on the pita bread and place it under a broiler until the cheese has melted for a quick pizza. Pita bread, especially the whole wheat variety, lends itself to a variety of healthy sandwich fillings. Fill a pita with chopped low-fat ham, low-fat cheese and black olives and place it in the microwave for one minute for a melt-in-your-mouth lunch. You can also fill pita bread with low-fat versions of tuna, chicken or egg salad. If you are a vegetarian, try a pita sandwich stuffed with hummus, avocado and bean sprouts.